When massive solar flares wipe out the technological infrastructure and kills billions, Rachel Wheeler sets out across the Appalachian Mountain wilderness in search of her notorious grandfather’s survival compound. Then Rachel is separated from her traveling companions and is captured by Zapheads, violent mutants who are gathering in packs and collecting dead bodies while mimicking human behaviors. Then Rachel undergoes startling changes herself, as her friends are hunted by a rogue military platoon that wants to impose its own law and order in the world of After. Can Rachel and her fellow survivors make the dangerous journey to Milepost 291 and evade the Zapheads long enough to form a new society and preserve the human race? Scott Nicholson is the international bestselling author of more than 20 thrillers, including the Next series, The Harvest, and Creative Spirit. His website is AuthorScottNicholson.com. excellent book series that is a easy read and has a good story. excited to find out what happens in the end. Entertaining and worth reading. The Zapheads are starting to get interesting and I look forward to the next few books. Really enjoying this series. Very interesting take on the post-apocalyptic world and a mutated human threat. Start with book one as the series follows from book one. 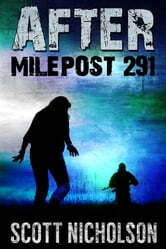 Milepost 291 was by far the best book in the series. So many unexpected twists and turns! I could not put it down.